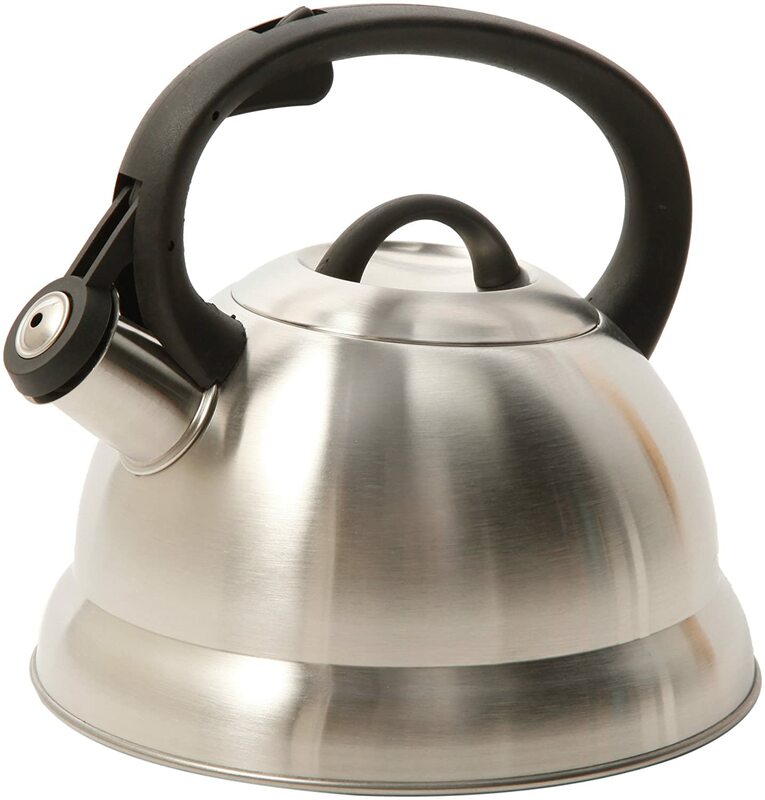 Are you looking for the best tea kettle for gas stove? This here is your ultimate guide. In today's technology-driven world, where there are apps for everything and appliances to cover every need, there’s something comforting about going back to a tradition that’s been around for thousands of years: Making tea in a tea kettle. Sure, electric tea kettles or tea makers have their advantages and microwaves will get the job done quite fast but nothing quite matches the simplicity of stove top kettles which is why they’re still around and probably will be around for a long, long time. If you’ve owned a traditional tea kettle before then you know what makes them so good and why they can go from kitchen appliances to pieces of art; If you’ve never owned one before then you should give them a try. We promise you won’t regret it. Not sure where to start? Don’t worry, we have your back! This article will teach you not only how to choose them, use them and care for them but will also tell you what are the best tea kettles for gas stove in the market today so you don’t have to guess when buying. - Let your kettle cool completely before cleaning. - Rinse and clean the pot, the infuser and the cover with warm water and no soap. - Wipe the outside with a clean cloth and turn the teapot upside down. - Air dry before covering. While unlikely, cast iron teakettles might rust. However, this isn’t a problem as the rust is non-toxic and tea connoisseurs think it enhances tea flavor. - Avoid dishwashers at all costs. - Dip a cloth with white vinegar and rub the stains until they disappear. - Rinse with warm water and dry the outside with a soft cloth. - Rinse the inside and discard the water. - Fill the kettle and bring water to a boil. Discard once its boiled. - Always use medium heat, not high heat. - Make sure the flame only hits the base and never reaches the sides. - Never let it boil dry and if you do, let it cool naturally. DO NOT fill it with water while it’s still hot. - Never use soap, detergent or any industrial cleaner. - Use natural household products, such as buttermilk, brown sauce and vinegar to clean the outside. - The inside should only be cleaned with warm water and your hands. - Allow the tea kettle to cool down before washing it. - Wash with warm and soapy water using a sponge or your hand. - For hard water stains, fill with equal parts white vinegar and water. Boil the solution and discard before cleaning and rinsing as usual. As we mentioned before, most glass teakettles are used to brew and show off teas, rather than to heat up water. If you’ve purchased a glass teakettle that’s compatible with stovetop use then stick to the directions and recommendations provided by the manufacturer. Cast Iron: Cast iron is a heavy and dense material known for its heat distribution and retention properties. It’s not an affordable material by any means but it’s resistant and teapots made out of this material are solidly built and very reliable. Stainless Steel: Stainless steel is, by far, the most popular material when it comes to teakettles because it’s affordable, durable and very versatile. Stainless steel also has antibacterial properties which makes them a great material for the health conscious individuals out there. Copper: C﻿﻿oppe﻿﻿r is one of the best materials out there when it comes to heat conduction which makes them a great choice for those who are in a rush. Not only that but copper teakettles are always attractive, making them conversation starters as well as amazing appliances. ​Aluminum: The most affordable of the bunch and thus the most popular material out there. Aluminum also conducts heat quite well and its lighter than all the other metals, making it a great choice for those who don’t feel like lugging around a heavy teapot. Glass: Glass teapots are designed specifically to brew “show teas” such as blooming teas. They’re not made to be used on the stovetop but we included them regardless because they’re gorgeous to look at. Talking about purchasing, now that we’ve covered the materials used to create teakettles, as well as the proper care for each one, let’s talk about the best tea kettle for gas stove out there. If you’re looking for a simple and traditional tea kettle then look no further, this whistling teakettle is as traditional as they come. This is a solidly built stainless steel teapot that was created to last for years. It’s was designed to heat up quickly and smartly, keeping your hands away from hot surfaces and hot steam at all points. This teakettle is easy to use –fill, pour and clean– and gorgeous to look at, as it will match just about every stovetop out there. A word of caution for induction cooktop owners out there. 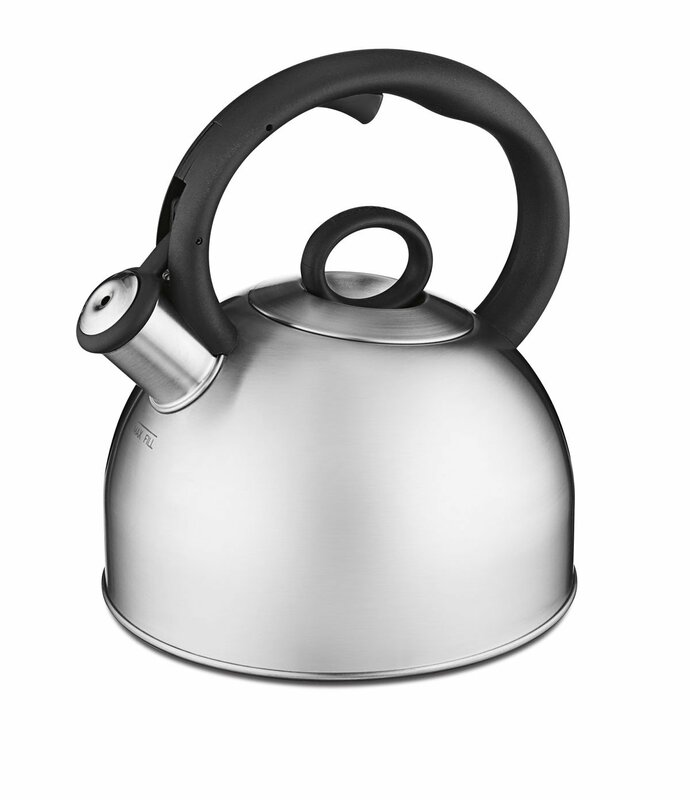 Beautiful as it is, this kettle simply isn’t induction compatible so you’ll have to look elsewhere. No one needs to start their day by spilling their coffee or tea which is why a gooseneck teakettle is such a good investment. This particular kind of spout is designed to increase the amount of control the user has over the liquids poured and it’s one this kettle’s best features. Another good feature is just how light and easily portable it is while still feeling sturdy and solidly built. It’s made out of steel and it’s compatible with gas, electric and induction stoves, making it a great option for everyone. 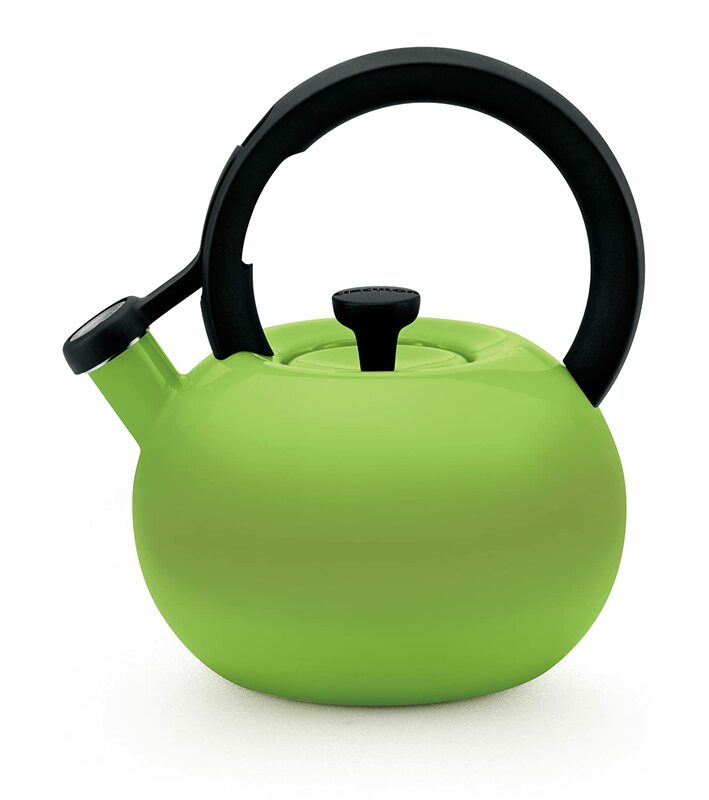 This teakettle’s remarkable design also includes a handle that curves away from the pot itself, reducing your risks of getting burned considerably. Of course, not everything is positive about this little kettle as it’s rather small and it comes with no whistle, so you’ll need to keep an eye on it to make sure you know when the water’s boiling. Another negative aspect, although a small one, is that the instructions come only in Japanese but teakettles are simple enough to use so there’s really no point in worrying. Beautiful teakettles have a lot to offer but sometimes all you need in life is a non-nonsense, straight to the point kettle and Mr. Coffee’s Flintshire Tea Kettle offers exactly that. This affordable and simple teakettle covers all the features a good kettle should have, such as compatibility with various kinds of stoves, whistling and an ergonomical design. It’s solidly built, sturdy and affordable which means that, as long as you don’t go around banging it against every surface, you’ll have a durable and long lasting investment in your hands. Because of the positioning of the handle it does tend to get rather hot so you should be careful when pouring hot liquids. Because of the simplicity of its design, there’s not much more to say about this teapot other than it works and it works well. There’s something about the design of this kettle that makes it stand out immediately. Maybe it’s the color or the large, circular handle but this is one of the best looking kettles out there and that alone gives it some points. Another great aspect of this teapot is just how roomy it is, capable of holding up to 2 quarts, perfect for the coffee or tea addicts out there. There aren’t a lot of features one can add to a teakettle without turning it into anything else but the few features kettles have this one matches in spades. It’s sturdy, it has a practical design that keeps your hand away from hot surfaces and it whistles, which means you’ll always know when the water is boiling. This is a sturdy and rather heavy kettle so if you don’t have a strong wrist it might be a problem for you. That said, its sturdiness does cause some troubles as it heats up rather slowly, specially compared to some of the kettles mentioned in this list. All in all, this is a solidly built and beautiful teapot that’s perfect for those looking to purchase a new teapot while also adding a splash of color to their kitchens. If looks are important but you don’t care much about color then the Cuisinart CTK-SS17 is for you. 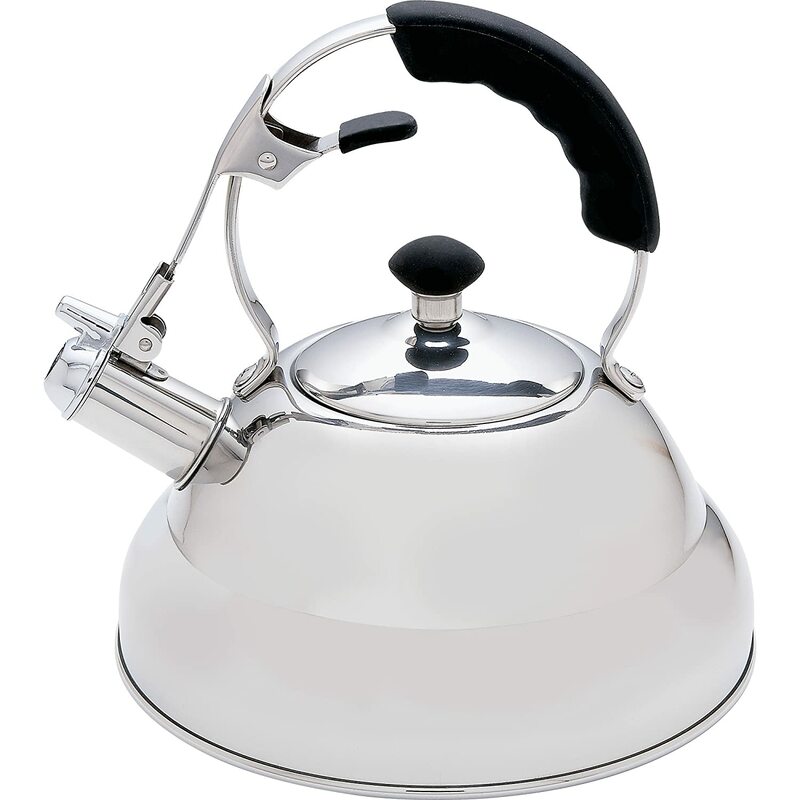 This teakettle is rather simple in its design but part of its charm lays in its simplicity as the large body and circular handle match each other giving it a beautiful and unique look. This kettle includes a loud whistle that’s perfect for those who get easily distracted but maybe not for those that get easily startled. It’s solid and sturdy built comes paired with a lifetime warranty that turns this from a teakettle into an excellent investment. Perhaps the best quality of this kettle is that the handles actually stay cold and the way they were built keeps your hands away from hot surfaces which means you can handle this kettle without fear of burning. The stout is rather short so, in order to pour hot liquids, you’re going to have to tilt the kettle more than with other designs which can be a problem for some. That, paired with its weight, does make this kettle rather unwieldy. While this is a stainless steel kettle, it does have an aluminum base which means that heat transfers quickly and without a problem. A word of advice, to those who constantly check on the liquid by removing the lid. You need to push it down hard in order to ensure it closes. Otherwise you might spill some water. Tea has been an important part of Japanese culture for thousands of years so you know they know what they’re doing when it comes to tea kettles. 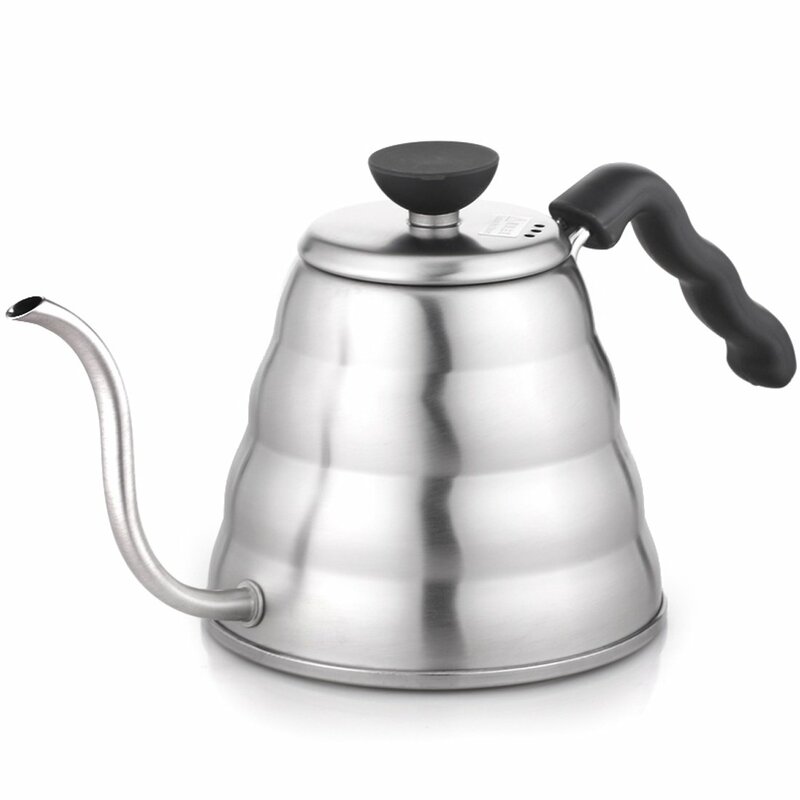 The Hario VKB is as beautiful as it is sturdy, thanks to its polished stainless steel, which feels thick and heavy at the touch. These qualities make it safe to boil your water with and able to sit on a table without toppling over easily, but it does reduce the conductivity of the tea kettle. This means the water can take longer to boil than with other kettles but trust us, the wait is worth it. What makes this kettle so special? With a goose neck spout located at the bottom of the kettle, you’ll always get a smooth and strong stream that will make pouring water a pleasure. This makes this tea kettle a remarkable choice if you’re brewing coffee with Chemex, but also if you’re simply pouring water for tea. The kettle is hard to clean, since the opening is rather small and the spout is impossible to clean without a pipe cleaner. There are increasing reports on Chinese versions of this Japanese kettle being sold online, so make sure you’re getting the real deal by either looking for this product in your city or contacting the vendor before buying online. Right away, the name of this product lets you know there’s something special about it, and it’s not the surgical stainless steel, though that doesn’t hurt. If you know anything about conductivity, you’ll know that few materials conduct heat as well as copper, which means that your water will boil and it will boil fast. So if you’re looking for a way to get hot water as soon as possible without having to use the microwave, this is it! 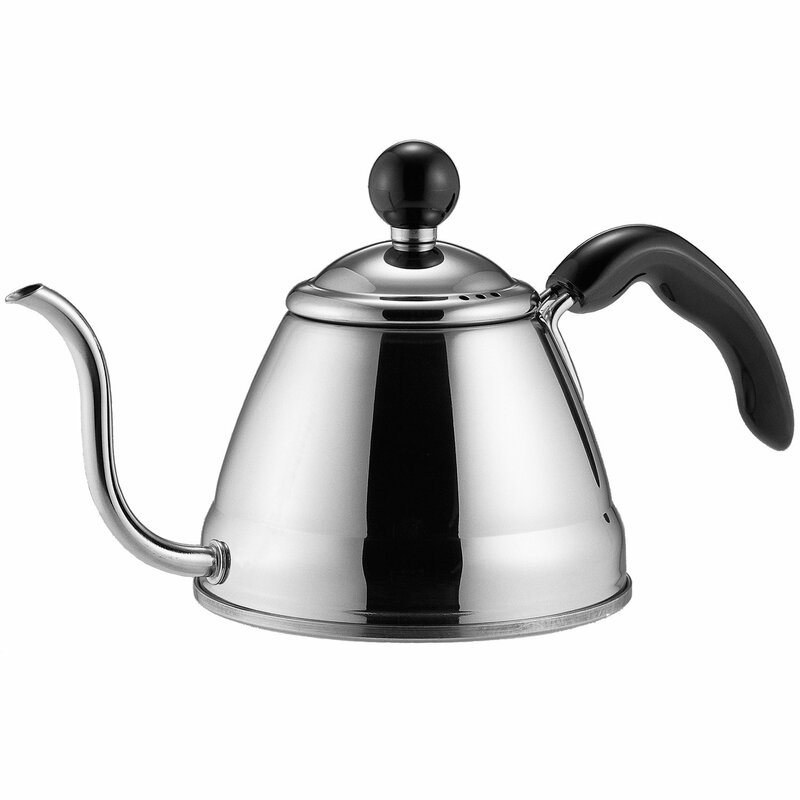 The surgical stainless steel has a mirror finish that makes it look amazing, and the few black accents it has come in the shape of a heat resistant knob handle and grip, which makes using this tea kettle a pleasure. Not only that, but this is one of the few induction compatible absolutely consider it. le tea kettles in this list, so you should absolutely consider it if that’s what you’re looking for. Another good quality is that this kettle comes with a whistle which will let you know when your water is boiling and it also has a lifetime guarantee, so you know you’re making a good investment. You should NEVER allow this pot to boil dry, as this carries the risk of overheating the seams at the kettle side and melting them off. This doesn’t happen if there’s water in it, so just be careful. Pouring the last of your water will require you to tip the kettle considerably. 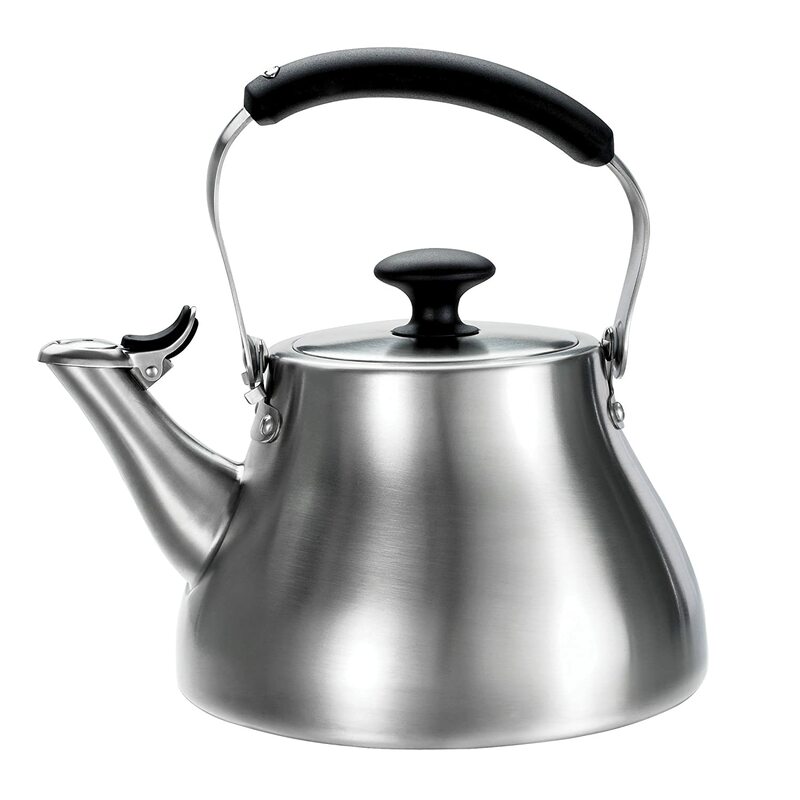 What is The Best Tea Kettle For Gas Stove You Should Buy? While there are plenty of advantages to electric appliances, sometimes it’s necessary to go back to a simpler time and tea kettles offer a great opportunity to do just that. We hope that this list helps you get the best tea kettle for gas stove that fits your lifestyle so you, too, can enjoy the pleasure that’s making a delicious cup of tea the old fashioned way. It has a solidly made: 1-piece body construction with no bottom seam to get messed up. Heats up quickly: wide bottom is smart design. ​Easy to use and pour. I love the glass. I want one for my father. He surely loves it. Thank you for the post. Thanks for your comment. I am sorry that orange tea kettle is a friend’s and she doesn’t have it anymore. This KitchenAid one is pretty close though (https://www.amazon.com/dp/B00K032XHK/ref=as_li_ss_tl?_encoding=UTF8&psc=1&linkCode=sl1&tag=cooknovel02-20&linkId=a638398fef037590fd57c2a59b46f52e&language=en_US). Thanks!